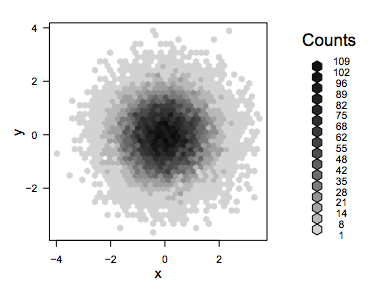 There are packages for creating this kind of plot in both "R" and Python. 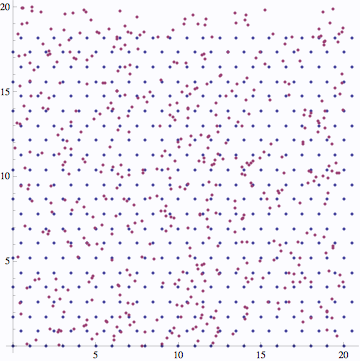 Obviously, the idea is similar to DensityHistogram plots. 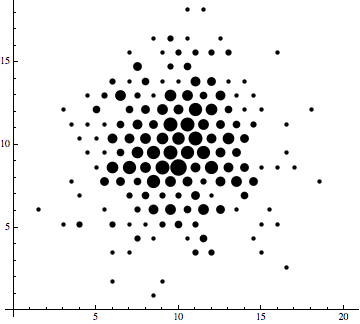 How would one go about generating hexagonal bins in Mathematica? Also, how would one control the size of a plotmarker based on the bin frequency? This gives the location of vertices with nearby data points. Unfortunately, I can't see how to count those data points..
As Jens has commented already, though, this is a unnecessarily slow way of going about it. One ought to be able to directly compute the bin index from the coordinates of a data point without going through Nearest. This way was easy to implement and works fine for a 500-point dataset though. The point is that a NearestFunction over just five points ought to be extremely cheap to evaluate—certainly much cheaper than your NearestFunction over the several hundred points in verttri. Then we just have to apply nearest on all the data points and tally the results. As this answer got much more attention than I thought at first, I felt compelled to pack the answer as a function. 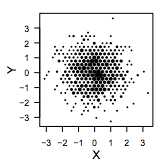 The following function draws three different hex-histogram representations of your data. Code stolen liberally from the question and from Rahul's answer. Here is a standalone function incorporating belisarius' standalone framework and Rahul Narain's fast use of NearestFunction. Full credit to these guys! note there is a fudge factor (1.05) to get rid of whitespace between the cells. Not the answer you're looking for? Browse other questions tagged plotting visualization or ask your own question. 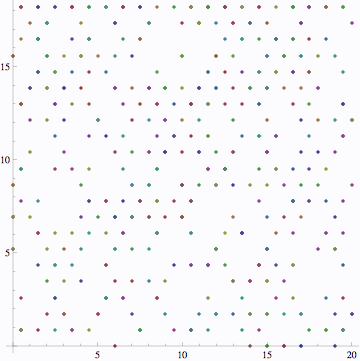 How to create a heatmap from list of coordinates? 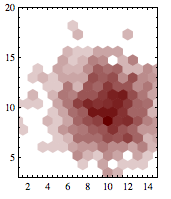 Make a density list plot/histogram from large, pre-binned data set?